Governments opposed to North Korea's apparent plan to test a long-range missile stepped up a diplomatic drive to stop the launch, issuing a barrage of warnings to the nation and threatening retaliation if it goes ahead. North Korea appears to be on the verge of test-firing a missile capable of reaching the United States, a prospect that has alarmed Washington and put the region on alert. Pyongyang was silent on the launch, but vowed to bolster its military deterrent. The chances of a launch Monday were unclear, in part because of the weather at the missile site. There were cloudy skies and chances of showers in the area, with fog along the coast, said Kim Duck-wan, an official at the South's Korea Meteorological Administration. Japan, the United States, Australia and News Zealand all cautioned the impoverished country that a test of a Taepodong-2 missile would bring serious consequences and further isolate the regime. Japan, which is well within range of North Korean missiles, has taken a lead in calling for a halt to preparations. North Korea fired a missile over northern Japan in 1998, stoking fears in Tokyo. "Japan has been urging North Korea to stop the attempt to launch a missile," Prime Minister Junichiro Koizumi said. "We are making efforts to urge North Korea to act rationally and with self-restraint." "If it does not listen to us and fires a missile, we have to consult with the United States and take stern measures," he added. He refused to specify possible steps, but other officials have mentioned economic sanctions and an appeal to the U.N. Security Council. Japanese Chief Cabinet Secretary Shinzo Abe suggested that China and South Korea could get more involved in the effort to head off a test. "It is important for countries involved to cooperate in restraining North Korea from launching the missile," Abe said, without specifying any countries. 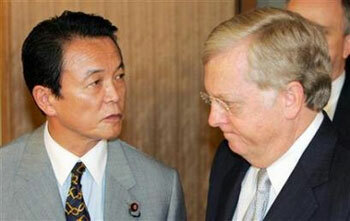 The U.S. ambassador to Japan, Thomas Schieffer, also said sanctions were an option. "I think sanctions would have to be considered, but I wouldn't want to describe what actions we might take," Schieffer said, according to a transcript read over the phone by a U.S. Embassy official. He added that a launch would be "worthy" of Security Council discussion and action. In Seoul, South Korea's ruling party called on Pyongyang not to put its "friend in danger" by testing the missile, as the opposition accused the government of not leaning hard enough on the North to stop the launch. "It is time for (the North) to make a decisive move toward establishing peace on the Korean Peninsula through cooperation with South Korea," said ruling Uri Party Chairman Kim Geun-tae. Australia, a firm U.S. ally, also voiced concern. Foreign Minister Alexander Downer said he sent a message to North Korea's ambassador to Australia, Chon Jae-Hong, "to warn him against a long-range missile test and to explain the serious consequences that would follow such a firing." He did not elaborate, but said a launch would be "highly provocative." In addition, New Zealand's new envoy to North Korea, Jane Coombs, will state her country's opposition to the test when she meets officials in Pyongyang later this week, Foreign Minister Winston Peters said Monday. A test of what is believed to be a Taepodong-2 missile would inflame a region already tense over the North's continuing nuclear weapons program. Six-party talks over the nuclear program have been stalled for months. The activity in North Korea came as the United States began Monday a major set of exercises off the Pacific island of Guam. The 5-day maneuvers, called "Valiant Shield," involve 30 ships — including three aircraft carriers — 22,000 troops and 280 aircraft. Pyongyang imposed a moratorium on testing long-range missiles in 1999, and White House spokesman Tony Snow said Sunday the United States expected the North to abide by that freeze. Japanese and South Korea news reports on Sunday reported that North Korea had assembled the missile on a launch site, with U.S. and other officials saying Pyongyang may have begun fueling the missile. The Taepodong-2 is the North's most advanced missile and is believed to be capable of reaching parts of the United States with a light payload. On Sunday, North Korean officials talked about increasing the country's "military deterrent," KCNA reported. The term is considered a metaphor for the country's nuclear weapons program.